Holiday time inevitably becomes very stressful, especially when we have to select the perfect gift for a friend or family member. The stores are loaded with merchandise. It’s overwhelming! Here’s a better solution: give the gift of art. A small painting, a ceramic or glass object – any original work of art is certain to please. And, it’s the gift that keeps on giving, as they say, because the recipient can enjoy it for a long time. At this time of year, Wilde Meyer Gallery asks its artists to produce small works that would be appropriate for gifts. At first, that was pretty intimidating to me, since I didn’t have experience painting in a small format. But once I started, it was so much fun! By keeping the subject simple, you can work quickly, so the piece is very fresh and energetic. Small works are more intimate, too, so they have a certain charm that larger formats can’t provide. 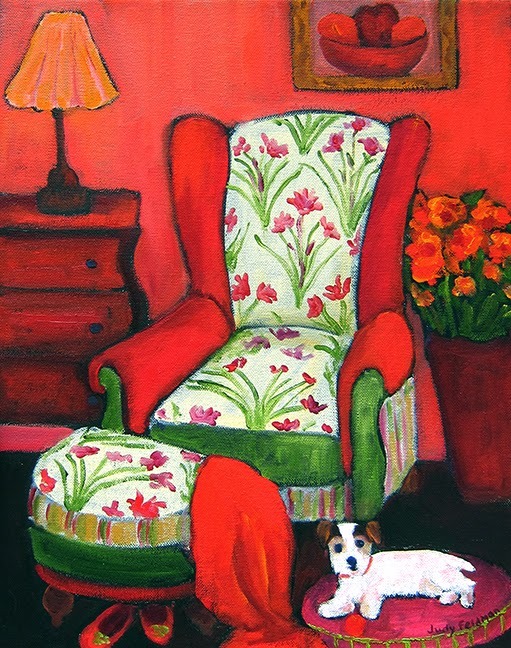 The painting I just finished, entitled “Sadie in the Red Room,” was a great way to explore all the different shades of red, and since I worked quickly, I used the wet-on-wet technique, which gives a painting a nice, soft look. 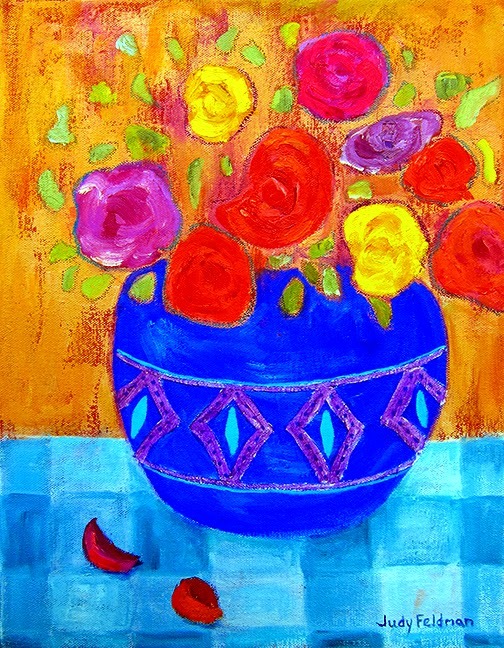 Red also played a role in another painting called “The Blue Vase,” since I used a layer of this color before I started painting the image. That technique gives the painting a nice, warm glow. One of the great things about purchasing a small work of art is the chance to give (or acquire for yourself!) a piece from a favorite artist that you may not have been able to afford in a larger size. The Wilde Meyer artists that I’ve spoken to enjoy creating these small works – sometimes they work as studies for larger pieces later on. 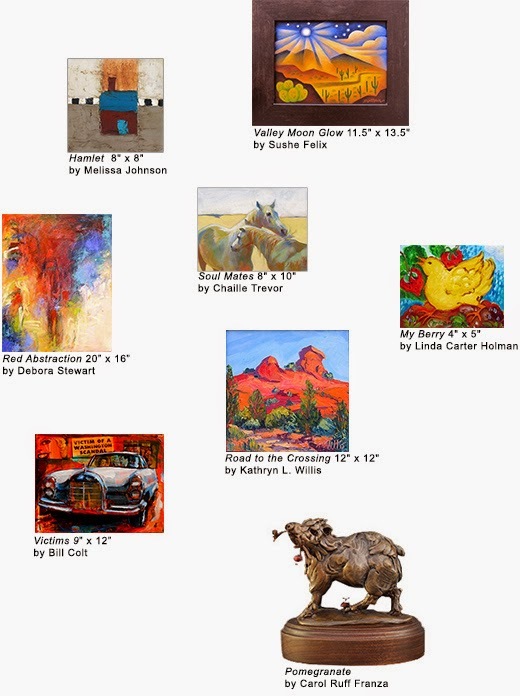 And, if your budget is larger, you can purchase several small paintings and offer them as a group arrangement. 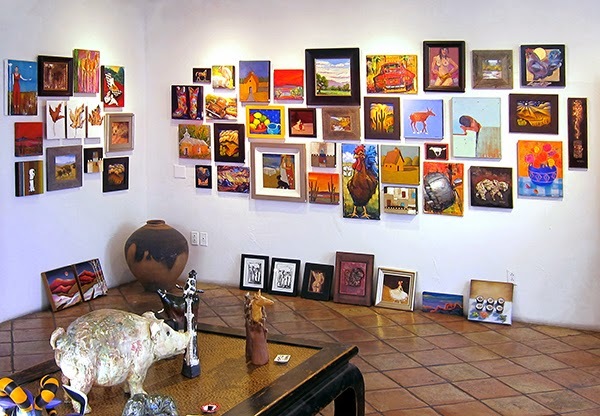 You might be a bit overwhelmed when you see the wall of small paintings in the holiday show at the gallery. But, it’s worth taking the time to look carefully, and ask Laura, Andrea, Ryan or Jonathan to show the ones you like by themselves. The gift of art is a unique and memorable one!